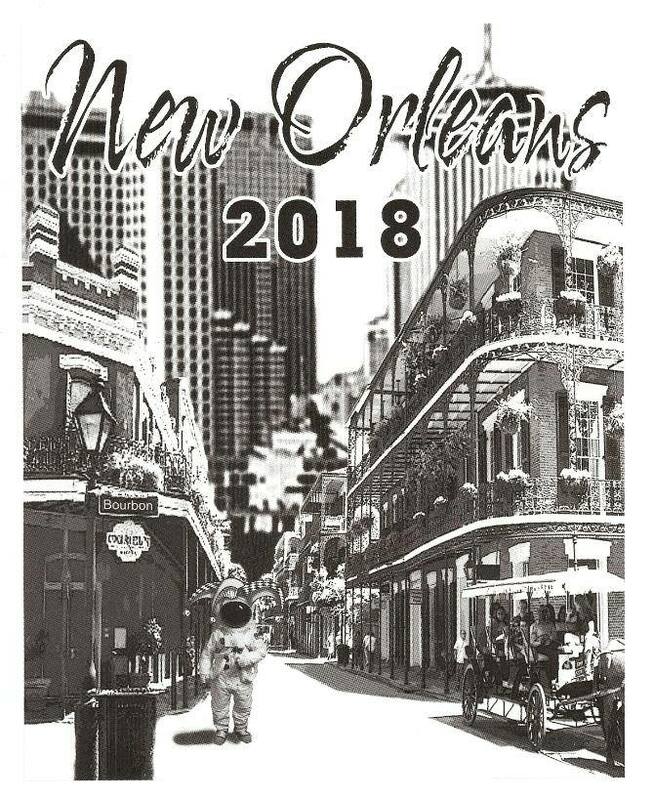 This entry was posted in Worldcon and tagged Debi Chowdhury, New Orleans in 2018, Rebecca Ann Smith, Worldcon bids by Mike Glyer. Bookmark the permalink. anyone know if the DC bid will try again? I live in the area. No. The DC17 bid was for 2017 only. The DC17 bid will also not be converted into a NASFIC bid (among other things, last night WSFA passed a referendum stating unequivocally that it would not participate in any NASFIC bid for 2017). New Orleans would be awesome! I’ll wait and see which one I want to vote on, but NO has got my attention with this update. No. The DC17 bid was for 2017 only. What is the logic of making a bid one year and not coming back to try again if you don’t succeed? I’ll focus on your husband’s, “I don’t know if…” part of that statement. Maybe he’ll reconsider. Our bid has dates that are the weekend before DragonCon and Atlanta is easy to get to. Locally, Southern Decadence is the week after our dates. Those who want to experience more of New Orleans culture might enjoy staying through the next weekend. No matter how you decide to vote, please stop by our parties. We’ll have a big presence at conventions all year. I’ll be at CapClave, Mysticon, Balticon, MACII and Smofcon. Debbie and Rebecca will be at others. Come by and we’ll pour you a drink. Cheers! But New Orleans in August? I’m not sure my body can handle that. Availability of the facilities is one reason. New Orleans always gets my vote. rcade: What is the logic of making a bid one year and not coming back to try again if you don’t succeed? No longer having enough money or energy to continue to bid — members of some Worldcon bid committees have dropped up $50K running a Worldcon bid. Travel, food and lodging — plus the cost of the parties can hit individuals’ wallets very hard. Especially when a lot of these folks also have day jobs — bidding eats up time, money and energy. SLM: “Too flippin’ hot” is the good weather at that time of year. When I was at NolaCon II in 1988 there was a tropical storm and we could see sheets of rain flying UP outside the windows of the hotel. Even though I first met my wife at Midamericon I (going to develop those pictures soon Fred? ), and being amazed at how much hotter DC is in August then May, I can only imagine what Nawlins would be like at that time of year. Today’s 86 (heat index of 94) in the twin cities reminds me why I left New England, when the whole month of August could be like this. Just putting together and promoting a bid is incredibly time-consuming and expensive. Members of the DC17 committee put in long hours and spent substantial amounts of their own money working on the bid, attending conventions to promote it, and otherwise supporting it. As they are all volunteers, the idea of setting up and doing this again was not appealing. They were offered an extremely good deal for 2017, which is why they bid for that particular year. Other years, the facilities are much more expensive and/or just not available. New Orleans in August would be too hot and humid. I have been there in Oct and Feb which were fine. There is also the chance of a hurricane which would be a real travel nightmare. So has anyone announced a NASFic bid for 2017 yet? I see San Diego was making noises about one at the last SMOFCon, but have there been any official announcements since Helsinki won the Worldcon? Living in Baltimore I’m not all that put off by the heat and humidity of New Orleans. Maybe it wasn’t “too bad,” but I don’t remember it being exactly balmy, either. Balmy …? Not at all, but not as grim as it can be ! I survived Baltimore in 83 and Atlanta in 86 (in the High Anxiety type hotel), and “but it’s a DRY heat” on the Phoenix NASFiC Anvil of God, plus the El Paso Anvil of a Lesser God for Westercon. Plus I’ve always wanted to see New Orleans. I mean, as long as they have air conditioning and ice makers, I can do it. And if the con’s mostly in one facility, it’s literally no sweat. Like Chicago. Anyway, it’s 4184 here… but it’s always 2:41pm. There’s a time-travel story in this. Google maps tells me that the Hyatt Regency is about a mile from Brennan’s, Olde N’Awlins Cookery, K-Paul’s, Cafe du Monde, etc. This is a good sign. I’m tentatively supporting the New Orleans bid, especially since the only thing I’ve heard from the San Jose committee in support of their bid is a complaint about the New Orleans weather in August. I have also seen New Orleans in the Dog Days of summer and swore I would never go back in the summer either. I skipped WorldCon to attend Hexfest (they were on the same weekend) and I was pleasantly surprised. The heat/humidity were much more tolerable than what I expected them to be. Walking around the French Quarter was quite pleasant even at 4PM. The evenings were perfect with the breeze blowing off Old Man River. I would encourage everyone to give it another chance in late August. As for the weather, hurricanes are acts of God. That is why you get travel insurance. We have very good air conditioning here. The convention will be in house with the hotel, so one need never expose themselves to the outdoors unless they want to. The Hyatt is very close to both the central business district and to the French Quarter. Nightlife is not far away and it also offers VERY GOOD AC. We are also really close to a shuttle from the airport and a short bus ride from the train and bus terminal. There is also a full sized Rouse’s nearby for all your party supplies. Did I mention 24 hour alcohol service? Oh, that’s probably not important. Nvm. New Orleans summer nights are balmy and breezy. Currently 84 degrees and dropping with a nice breeze and no sun. Sunset time around 7:30 and that makes a big difference in how hot it feels. We’ll all be at the con before that, right? Mike got to see a tropical storm at Nolacon II. No power loss a really cool window show with some white noise. In the event of a national disaster, you couldn’t be in a place with a better trained local population. We can also guarantee there will be no wildfires or water shortages. Not that either of those things could ruin a WorldCon. I had a blast in Spokane and enjoyed everyone I met. Done shamelessly plugging, for the moment. Bear with me, I’m proud of my city and glad we’ve got our hat in the ring. I’ved lived in Baltimore as well as Baton Rouge. New Orleans in August is not to be trifled with. On the other hand, LaSFFF was great when I was there. @Morris Keesan: I don’t know much about the San Jose in 2018 bid, except that the bid chair is Andy Trembley, who in 2013 co-chaired the Westercon that revived Westercons. But New Orleans could be great. @Jon Lennox: No NASFiC bids for 2017 yet. I kept hearing folks talk about how good it was to have four good site selection choices — and thought, good for you, but damn-near ruinous for three out of four of the bidding groups. Did I mention 24 hour alcohol service? And you can walk around with it. If you go out to brunch, and you don’t quite finish your drink, they will ask you if you want the rest in a to-go cup. The bars on Decatur Street have walk-up windows so you can order from the sidewalk. Seriously, though — totally supporting any bid to have Worldcon in my hometown and favorite city in the world. Any time of year. Squee! And speaking of that really good A/C – you might want to bring a light jacket or sweater. We are serious about A/C in August. You’re hired. Please report to the New Orleans tents at the fan village at MACII and we’ll give you a fun job. Or email me. nolarivers@gmail.com. Or just show up and dance. You know I am counting on you to help with the costumes. Thanks in advance. Am planning to be at MACII, after all, so what the hey, might as well make myself useful. I’m not sure you actually want me dancing, but my karaoke rendition of “What’s Up” (4 Non Blondes) is legendary or at least infamous. Email in the morning, however. Am already tucked into bed, and starting the email reader past that time is just asking for trouble. Thank you for fielding the questions about bidding. It is exhausting, terribly expensive and really fun. Everyone working on both bids for 2018 is pouring their guts into their campaign. The San Jose team has some wonderful people working for it. We are throwing a joint party for the 2018 bids at DeepSouthCon / CONtraflow the first weekend of October in order to defray costs and volunteer hours for both teams. All of us want the same thing. We want to host our friends and show off our town. Thank you for the support. The overwhelming reaction to our bid has been very positive. Win or lose, I look forward to meeting more of you over the next year. Mike, I think you may have the wrong “Rebecca Ann Smith” tagged for this article. I’m one of the co-chairs of the New Orleans bid and I’m actually “Rebecca Anne Smith.” It’s the curse of the “Smith” name. Even having a first name like “Rebecca” isn’t enough to make it even remotely close to unique. By the way, although folks from dry climates complain about the travails of enduring a trip to a humid climate in Summer, those of us from humid climates also suffer from the change in climate to a dry one for an extended period. Each time I’ve attended Worldcon in a very dry place, like Spokane or Reno, I’ve had to continually apply lip balm (even waking up during the night to do it again), felt constantly thirsty, had odd changes to my skin and my sinuses became so dry that they started to bleed just a little bit. As for holding Worldcon in a place where a natural disaster could possibly occur (like a hurricane or an earthquake), I’m still getting over the case of bronchitis that accompanied me home from Sasquan. Mind you, I think Sasquan may be one of the most successful and enjoyable Worldcons ever and one seldom sees such natural beauty as the Spokane Falls right next to the con, but there is never any guaranty that the natural world will cooperate with the convention’s plans. Rebecca A Smith: Yes, I see there a completely different Rebecca is the source of the earlier tag. I have changed the tag to “Rebecca Smith” and will work on using the right one hereafter. Ha! You win an internet. And still more points for the classy shoutout to the San Jose team. San Jose would be cheaper, as I could drive there, but I’ve never been to New Orleans and would love an excuse to go.